Following the fires in ACT there has now been a decision made to replant portion of the ACT plantation area and to rehabilitate the riparian zones with native species and install wildlife corridors in the new plantation areas. “The fire disaster stripped all vegetation from the 10,500 hectares of the plantation and the run off and erosion experienced has been enormous with the effect of the fire, drought and then storm events causing soil movement. 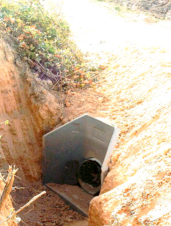 This has meant an increased need for the installation of culverts at sometimes 50 metre intervals in order to reduce water volume and velocity and to reduce flow impacts,” said Neil Cooper, Operations Manager for ACT Forests. 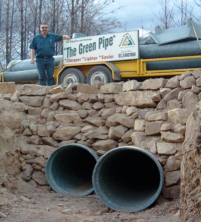 “We have been installing a semi-trailer load of plastic culvert pipes every week and these have been in 350 mm, 450 mm and 550 (sic 600) mm diameter sizes and in 6 metre lengths. The advantage of plastic pipes is the ease of handling due to their lightness. We can have the pipes installed by two men without any need for machinery to load and unload them. The pipes come with a tapered end and they interlock. Where the pipes are longer than we need we can cut off a section with a chainsaw. These sections can also be ripped into two half sections which are then used as a flow channel to dissipate water energy at the outlet end and lead the water into rip-rap to prevent scouring. “The choice of the use of plastic pipes has been easy as we had used them prior to the fire. The majority of these came through the fire unscathed, and it was only where we had lengths protruding out of the soil that the pipe was burnt and damaged in this recent fire. “The advantages of plastic pipes for us are numerous. They are easy to obtain in a large quantity and are quick and easy to unload the semi-trailer when they arrive. This is important as we lost all equipment such as backhoes and forklift trucks in the fire,” said Cooper. “We employ two-man contractor crews, and they can easily pick up, transport on a light truck and install these pipes and the plastic headwalls and do not need a machine on each site to install the culverts. “They can each achieve the installation of 30 culverts per week as we work through our clearing and site preparation of 120 to 150 hectares per week. 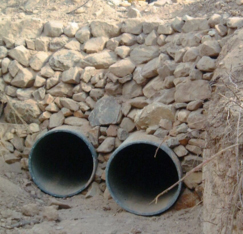 The advantages of plastic culvert pipes and headwalls are certainly helping to limit erosion potential as rapidly as possible. “In planning the re-establishment of these plantations we are applying the principles of sustainable land management and it is like working on a new canvas. We are evaluating the road network, and often eliminate the need for some roads and rehabilitate these and establish new roads which meet future harvesting needs more effectively. Also steeper areas, riparian zones and wildlife corridors are planned to be planted with native species in order to provide better protection of all conservation values in the new plantations. Where we previously had 10,500 hectares there will eventually be only 7,500 hectares. We have approached this new design of the plantations on a sub-catchment basis so that full consideration of all the factors is taken account of in the planning. “As we work through an area the debris is stacked and burned with large tractors such as CAT D8N and Komatsu D155 tractors. This is followed up with ripping and mounding on the contour, and we are hoping to have 1,300 ha prepared and planted this year and to follow up with 2,500 ha in each of the following years till the job is completed,” said Neil Cooper. 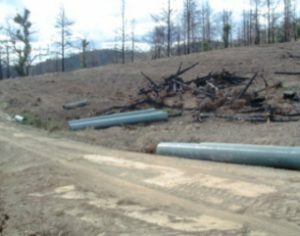 Clearly, Recycled Plastic (sic Technology – The Green Pipe) culvert pipes are aiding in the rehabilitation of one of the ACT’s economic and environmental assets where the pine plantations protect the soils of Canberra’s catchments and quality of water as well as provide housing, furniture and attractive forests to recreate in as they grow and mature.